This article was published in Armenian Review Vol.36 #2(1983) pp.6-46. One of the most important offices in Arsacid Armenia belonged to the sparapet or commander-in-chief of the armies. Like many other offices in the Armenian kingdom such as those of the coronant, the chamberlain, and the master of the hunt, the sparapetut'iwn was a hereditary charge held traditionally by the senior member of one family, the Mamikoneans. Exactly when the sparapetut'iwn was instituted in Armenia is not known, since the earliest relevant Armenian sources (fifth century) give a confused picture of the establishment of Arsacid offices in the country. Likewise the time of the abolition of the office is unclear since one meets Mamikonean sparapets after the fall of the Armenian Arsacid kingdom (A.D. 428) and during the seventh and eighth centuries. In the medieval Bagratid and Arcrunid kingdoms as well as in Cilician Armenia, the sparapetut'iwn was still an important office, although with the removal of the Mamikoneans to the Byzantine empire in the late eighth century, its occupants were drawn from other lordly (naxarar) families. Because of Armenia's strategic geographical position between two mighty and inimical powers, Rome-Byzantium on the west and Iran on the east, the country was often forced to participate in the campaigns launched by one empire against the other. As an ally of the one and a border state of both, Armenia was subjected to devastation by the armies of both empires. The almost perpetual state of war which was endemic between Armenia and its neighbors, as well as warfare within the country between the Arsacid kings of Armenia and their naxarars, made the sparapetut'iwn an institution capable of rivaling the country's bnik ters ("native lords"), that is, the Arsacid kings themselves . Etymologically the word sparapet derives from Ihe Parthian spadapet (spad-army, pat-leader) which in turn derives from the Old Persian spadapaitis (1) . The Iranian origin of this word and of other Armenian Arsacid official terminology is a reflection of Armenia's long cultural and political ties with Iran which date from Achaemenid times (2). Although there exists no separate study of the sparapetut'iwn, both Iranists and Armenists perforce have commented on the importance of this office and its occupants in their works on Iranian and Armenian soclety. Among Iranists treating the Sasanian Eran-spahbad the most detailed information is found in the writings ot A. Christensen and G. Widengren. Christensen, in L'Iran sous les Sassanides, wrote that in the Sasanian hierarchy each of the four social groupings, the clergy (asravan), soldiers (arteshtaran), bureaucracy (dibheran), as well as the commoners (vastryoshan) and artisans (hutukhshan), had a supreme head. The chief of the military was the Eran-spahbad, and until the time of Xosrov I (531 579), the Iranian army was under the command of a single Eran-spahbad who performed the threefold functions of minister of war, commander-in-chief, and negotiator of the peace (3). As a result of Xosrov l's military reforms, four spahbads were created in place of a single leader. The spahbad of the east controlled the armies of Khurasan, Sacastan, and Kerman; the spahbad of the south, the armies of Pars and Susiana; the spahbad of the west, the armies of Iraq to the Byzantine frontier; and the spahbad of the north, the armies of Media and Azerbaijan (4). Since the rarely-encountered officer known as the arteshtaransalar (chief of the warriors) is not mentioned after Kavadh and the Eran- spahbad was abolished during the reign of Kavadh's successor Xosrov I, Christensen equates the two terms (5). In L'Iran sous les Sassanides. Christensen expressed doubt that an of iice as important as that of the Eran- spahbad could be hereditary in one family. G. Widengren cites the transmission of the Armenian sparapetut'iwn in the Mamikonean family as an example of such a tendency and believes that the Iranian Eran- Spahbad was also a hereditary position (6). Among Armenists, the sparapetut'iwn has been examined most notably by N. Adontz and C. Toumanoff. Adontz placed the consolidation of the Mamikonean holdings in the southern district of Taron during the reign of king Trdat the Great's son Xosrov II Kotak (ca. 330-339). While noting the existence of sparapets prior to the accession of king Arsak II, Adontz seems to place the real establishment of the sparapet as a court official (gorcakal) during Arsak Il's reign (350-367) (7). The Mamikonean as sparapets, were said to stand above all thc zoravark' or military commanders Thc Armenian army was made up of many contingents furnished by the princely houses. Each of these detachments was commanded by its own prince, but the supreme command belonged to the hereditary sparapets, the Mamlkonean house, who, in this sense stood "above all the princes and their armies"(8). The bishop of the Mamikonean held the leading position in the Church after the patriarch or Catholicos, the influence of the naxarar system is obvious in this case. Just as the hereditary Mamikancan sparapets stood at the head of the nararars under the Arsacids and even later, so in ecclesiastical affairs, the chief administrator found at thc side of the Catholicos was the representative of the same house (10). Toumanoff believes that the Mamikoneans were the "immemorial dynasts" of Tayk', a district on the Armeno-Georgian border, and were possibly of Georgian origin. Although he mentions Mancaeus, defender of Tigranocerta against the Romans (B.C. 69), as the first historically visible member of the dynasty, Toumanoff does not specify when the sparapetut'iwn was entrusted to the Mamikoneans. He notes that by the fourth century this family had acquired half of Taron centered in the castle of Oghakan on the Arsanias river. By 439, as a result of the will of St Sahak, the last descendant of St. Gregory, the Mamikoneans acquired the other half of Taron centered in the city of Ashtishat as well as the principalities of Bagravande and Acilisene --making them "the greatest territorial princes of the Monarchy, ruling a State that nearly sundered it into two halves" (11). Toumanoff compares the sparapet with the Iberian (Georgian) spaspet (12) who, unlike the sparapet held an apparently non-inheritable office (13) which included civil as well as military functions (14). Finally, Toumanoff suggests that while in Sasanian Iran both an Eran- spahbad and an Aspahbad (master of the horse, i.e., head of the cavalry) coexisted, in Armenia this could not have been the case since the Armenian army was primarily cavalry. He concludes therefore that the term aspet which the Armenian sources apply to the Bagratid princes was not an official, administrative, but merely a family title (15). Before turning to an examination of the relevant Armenian sources on the sparapetut'iwn, some general observations on these sources are in order. First, none of the sources considered in this study was written while the Arsacid dynasty ruled Armenia. The Arsacids were deposed in the Byzantine-controlled portion of the country in 390 and in the Iranian-controlled portion in 428. The earliest example of classical Armenian writing to survive, the Bible, was not finally translated until after 431 (16). The historical sources with which we are concerned describe a kingdom which had long since lost its glory. Thus, although the sparapetut'iwn outlived the kingdom which created it and existed throughout the fifth century, one has no guarantees that the sources faithfully describe this institution in the heyday of the state (i.e. as an Arsacid institution). Second, the sources which have survived even from the post-428 period are few and belong to different genres. Koriwn's Life of Mashtoc' is a biography; " Agat'angeghos'' is a short epic account of Armenia's conversion to Christianity; the History by P'awstos Buzand is more a collection of episodes than a history; and Ghazar P'arpec'i's work is a eulogy of the Mamikonean family. Third, although some of these books contain the word "history" in their titles, not one of them is a history of Armenia. Instead they are, for the most part, the products of House historians who have written about the role of a particular family in Armenian affairs. P'awstos Buzand and Ghazar P'arpec'i were both historians of the Mamikonean House. Thus their works contain few disparaging remarks about their patrons and most likely numerous half truths and outright distortions. Finally, one is obliged to eliminate from consideration two works traditionally accepted as fifth century compositions: Eghishe's On Vardan and the Armenian War, and the History of Armenia attributed to Movses Xorenac'i. Serious doubt was raised about the dating of Eghishe's history by N. Akinean who believed that rather than describing the Vardananc' (450), the work might instead be an account of the late sixth century rebellion also led by a Vardan Mamikonean (17). Eghishe, a Mamikonean sympathizer, is unknown to the definitely late fifth century P'arpec'i who most certainly would have used the former's work had it existed when he was writing. In any case, Eghishe's history does not contain any information on the sparapetut'iwn which differs from what is found in P'arpec'i. As regards Xorenac'i, this enigmatic writer and/or editor seems to have operated in the last part of the eighth century. He is violently anti-Mamikonean and provides much information on the sparapetut'iwn which contradicts the sources which will he examined here. For this reason Xorenac'i's history cannot be ignored, but neither can it be classed with authentic fifth century sources. A discussion of Xorenac'i's information on the sparapetut'iwn therefore is confined to the notes (18). 1 H. Hubschmann, Armenische Grammatik, I. Armenische Etymologie (Leipzig, 1895), p. 240. F. Justi, Iranisches Namenbuch (1895, repr. Hildesheim, 1963), p. 306. 2 The Armenian and Iranian social patterns also show numerous similarites. In Armenia, as in Iran, supreme power was exercised by a monarch ever engaged in a struggle against his own family, the nobility, and frequently against the clergy as well. In both societies the power of the nobility tended to increase with the consolidation of the state apparatus. An explanation frequently given for this phenomenon is that during the establishment of a new royal clan, in the process of overthrowing the old royal clan and its noble allies, the would-be monarch was forced to rely on the armed might of the country's dynasts who possessed large private armies. Following the seizure of power from the previous ruling clan, the new monarch was obliged to give gifts to his loyal comrades-in-arms. Such gifts were in the form of land grants. A second stage in the growth of the nobles power came as the state increased in size or was centralized. To administer his realm, the monarch had no choice but to turn again to the most powerful rulers of the land and distribute the most important offices to them. Among these "most powerful rulers of the land" must be included not merely the king's noble supporters, but also the aboriginally powerful dynasts and clan leaders whose true power in a particular locality was not only more firmly established than that of the king, but also frequently predated it. Thus as Iranists and Armenists have noted, a mixed bureaucracy existed in both societies composed of dynasts receiving office in recognition of their ancient and real military rights and of royal appointees (such as junior members of the royal clan) through which later group the monarch tried to maintain or expand his control over the nobility. Again in both societies a hereditary principle operated which meant that offices and land grants remained in a particular family as inalienable possessions. This meant in Armenia, for example, that if the sparapet died or was killed, another member of the same family had to fill the vacant position. In the case of land-holdings, the king could not reclaim his grants and could not confiscate one family's lands without first exterminating the entire clan since as long as one male member of the clan survived, the family holdings could he reclaimed and the clan gradually reestablished when the surviver reached maturity. Any attempt on the part of the crown to alter their rights and privileges was resisted militarily by the nobllity. In both Iran and Armenia it was through an oath of personal allegiance sworn before the king that a noble expressed his "vassalage" or recognized the king's military superiority. The oath of allegiance carried with it the obligation of military service. Each nohle was assigned a gah (seat, place) at royal assemblies based on the number of cavalry he could provide. As Adontz, Christensen, Widengren, and others have shown, the Armenian social, ethnic, and military vocabularies bear a heavy Iranian stamp. For example, (Arm.) nahapet-Ir. nafapat; ishan-xshana; zoravor-zoravar; azg-azg; patiw-patev; shnorh-shnorh. Most revealing of all, the names of the Armenian nobles themselves are often Iranian: Varaz, Bagarat, Vahan, Vardan, Vagharsh, Vasak, etc. Comme ces faits armeniens nous ont servi a confirmer que les conditions decrites dans le SN [Shahname) sont valables pour des temps ante-islamiques, les faits armeniens peuvent aussi servir a supplement pour la periode parthe meme en Iran proprement dit et ensuit pour la periode sassanide. See G. Widengren, "Recherches sur le Feodalisme iranien", Orientalia Suecana, V (1956); 94 and passim. R. Frye, The Heritage of Persia (New York, 1963); and N. Adontz, Armenia in the Period of Justinian, N. Garsoian, trans. -ed. (Lisbon, 1971), passim. 3 A. Christensen, L'Iran sous les Sassanides (2nd ed.. Copenhagen, 1944), p. 99. 6 Widengren, op. cit., p. 108. The great value of Widengren's study is that the author frequently draws upon Armenian sources to fill some of the many gaps in our understanding of the Iranian social pattern. As a result of this study Widengren equates certain Armenian and Iranian terms such as "servant"/"vassal" (Arm. caray. Ir. bandak), house/holdings (Arm. tun, Ir. katak), decree (Arm. hrovartak. Ir. fravartak), military detachment/banner (Arm. drawshs, Ir. drafsa) and others. Widengren, pp. 93-94. 7 Adontz, op.cit., p. 185. 11 C. Toumanoff, Studies in Christian Caucasian History (Georgetown, 1963), p. 209. 12 Ibid., p. 97 n. 144. 13 Ibid., p. 141 n. 253. 14 Ibid., p. 211 n. 238. 16 The earliest use of the term sparapet is found in the Bible, translated by different hands soon after the creation of the Armenian alphabet in the early fifth century. Usually sparapet is given as the equivalent for Greek strategos (I. Ezra 3. 14; I Maccabees 2.66, 14.47; II Macc. 3.5, 4.4, 8.8, 8.9; III Kings 2.22, 2.31; Judith 2.4, 2.5). 17 N. Akinean, "Elishe vardapet ew iwr patmut'iwn hayoc' paterazmi [Eghishe Vardapet and His History of the Armenian War), Handes Amsoreay, 1931-32; 1933-34; 1935-37; 1950-51. 18 See note 219 on Xorenac'i. 330-339 Xosrov II Kotak - Vach'e Mamikonean, son of Artawazd (PB III.4) Artawazd, child son of Vach'e, is made sparapet. During his childhood his relatives by marriage, Arshawir Kamsarakan and Andok Siwnik',control the army (PB III.11). 339-350 Tiran - Under Vasak and Artawazd the Mamikoneans withdrew to Tayk' (PB III.18). Arshawir Kamsarakan and Andok Siwnik' apparently are in charge of the army following Tiran's blinding and before Arshak's restoration of the Mamikoneans (PB III.20). 350-367 Arshak - Vasak (PB IV.3). Restoration of the Mamikoneans. Vasak's son Mushegh returns Pap to Armenia, accompanied by stratelat Terentius and Count Ade. Mushegh becomes zoravar-sparapet (PB V.1). 367-374 Pap - Hayr (Dghak) mardpet, placed in charge of the eastern border by Terentius and Mushegh, defects and is replaced by Gnel Anjewac'i (PB V.6). 374-378 Varazdat - Bat Saharuni. Mushegh is the power behind the throne until his murder by Varazdat. Manuel Mamikonean returns to Armenia after imprisonment in Iran. He seizes the sparapetut'iwn, kills Bat and his sons, and expels Varazdat(PB V.37). Manuel Mamikonean (385). Artashir, son of Manuel (PB V. 44). 430's-440's? - Hamazasp Mamikonean (GHP I.18). d. 450-451 Vardan Mamikonean, son of Hamazasp (GHP II). 480's-506? Vahan Mamikonean, nephew of Vardan (GHP III). 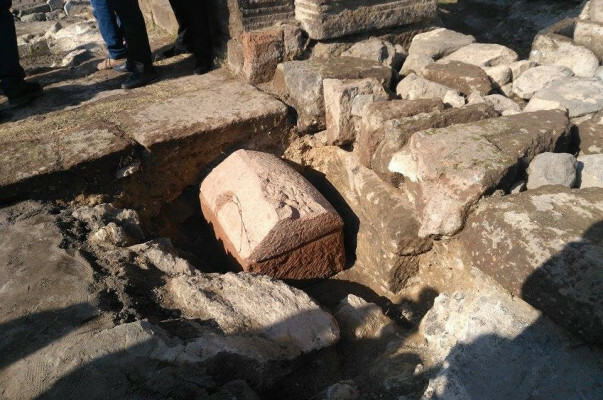 A special team of archaeologists on Saturday unearthed the third shrine of the Arsacids (Arshakunis, AD 54-428) in Aghtzk, a village in Armenia's Aragatsotn region which is historically known to be home to the royal family. The historic ceremony was attended by President of the National Assembly Galust Sahakyan, Minister of Culture Armen Armiryan, Russian Ambassador to Armenia Ivan Volynkin, member of the National Assembly Aragats Akhoyan (Prosperous Armenia), and residents of the village. 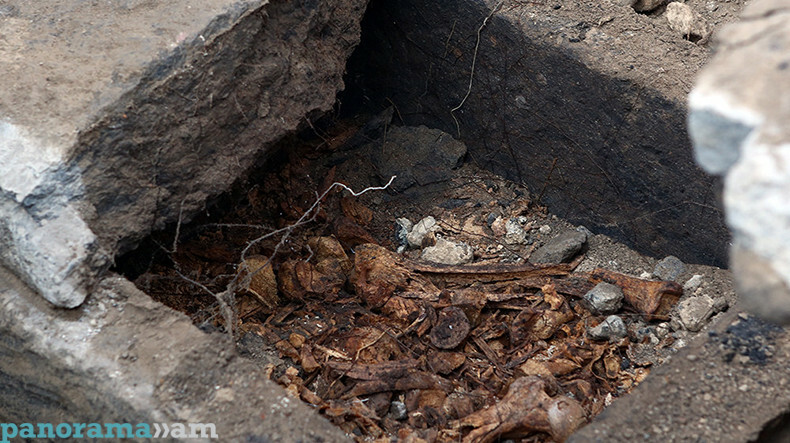 Speaking to reporters at the excavation site, a lead archaeologist of the team, Hakob Simonyan, said they have completed only the first phase of their activities to later submit the excavated samples for laboratory testing before creating museum exhibits. “The research allows us to conduct an excursus from the 4th century until the period of Shah Abbas the Great’s invasion, the 17th century, to see the genetic structure of the people who lived here and the genetic transformations in ourselves,” he explained. Minister Amiryan added that they are planning to fund a special project aimed at turning the ancient crypt into a museum and making the village a special tourist attraction site. It is comprehensible why the study can be of importance to the Persian and European scientists, but why should the relics of the Armenian kings be interesting for the Americans? In response to the above mentioned question the archaeologist noted the following: "The relics of the kings who ruled during the early medieval period are rare worldwide. They realize theimportance of this discovery. It is quite likely that if we submit letters they could help us driven out of interest and conduct DNA analysis for free of charge." Notably two of the chests had been opened earlier and opening of the third one took place on 12 November. The relic-chests contain the bones of the members of the Armenian Artashesyan and Arsacid royal houses. H. Simonyan noted that the bones are subject to anthropological research, so that they can be able to present the complete and final results of the discovery. "This is a long-lasting, difficult and expensive activity. The research is to be conducted by the best specialists in the most prestigious laboratories of the world. All this requires significant amount of money, and we should seek and find out that funds. The anthropological research will enable us to find out the people's age, gender, they diseases they suffered from, and it is also possible to reveal the causes of their death. DNA analysis would reveal their genetic code," the archaeologist noted. H. Simonyan added that the carefully packed relics will be taken to the laboratory and after conducting anthropological research they will be kept in a fridge so that they are not subjected to any modifications. "After the research, I think, a governmental commission is to be established to decide the future of the bones, namely where they should be presented and how they should be kept. We might not have a second chance to make such a discovery," the head of the expedition noted. In response to the question how they can acquire the necessary sum he noted that it is the issue of the government as the government itself sould be interested in providing the necessary funds. The discovery has a great importance for the country and the state is to tackle the issue.